Preheat your oven to 180C/350F (160C/320F fan forced) and line a 12 hole muffin tin with squares of baking paper or muffin cases. Peel and grate the apples and chop the butter into cubes. Transfer the apple and butter into a small saucepan and cook for 5 minutes over medium heat, stirring occasionally until the butter has melted and the apple has softened. Meanwhile, mash the bananas in a large mixing bowl, using the back of a fork and then add the flour, baking powder, cinnamon, and eggs. When the apple and butter mixture is ready, transfer it to the mixing bowl, and stir all the ingredients together until well combined. Spoon the mixture into the muffin tin. 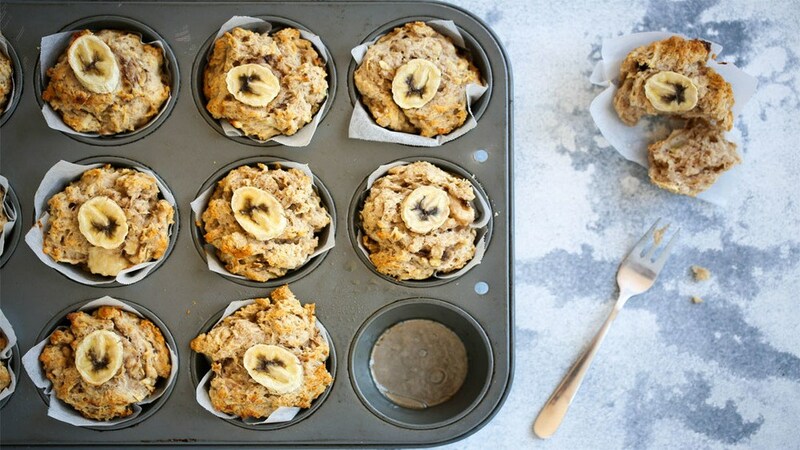 If you have an extra banana, slice it into rounds and pop a slice of banana on top of each muffin. Transfer the muffin tin to the oven and bake for 20 minutes.